As the founder and executive director of PRERNA, Meena Sankaran is passionate about social and environmental causes. Her deep appreciation of the simple things in life influences the changes she seeks. A technologist and social entrepreneur by career, she has a deep desire to contribute to the wellbeing of the community and feels the need to help the underprivileged to succeed. That is why empowering refugees is a highly personal mission for her. Born and raised in India, Meena immigrated to the United States as a student. 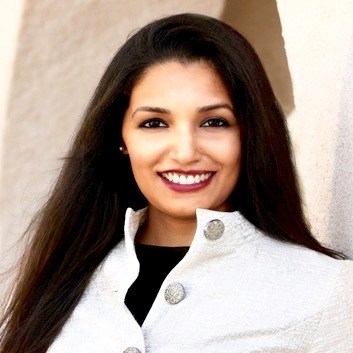 Through this firsthand experience, she has a comprehensive understanding of the difficulties involved in moving to a new country along with the importance of assimilating into the U.S. Download a biography of Meena Sankaran. In her own words, Meena shares why PRERNA is so close to her heart: “When my parents sacrificed their own happiness to get me to this great country [U.S.], I never forgot the blessing and committed myself to pay it forward someday. My humble beginnings of volunteering began as a child and it became a part of my DNA every time my parents got the opportunity to serve others. Whether it was feeding the homeless or recording for the blind or dyslexic, giving back to the community has been the most fulfilling part of my life. During my time volunteering in Arizona with struggling refugees, I interacted with many families across different ethnicities. It wasn’t long before I realized the gaps there were in services needed by refugees, and the lack of resources available.” For over a decade, Meena has helped to resettle many individuals and families into the states of Arizona, New York, Ohio, North Dakota and California. She has played an important part in making their lives comfortable and sustainable.